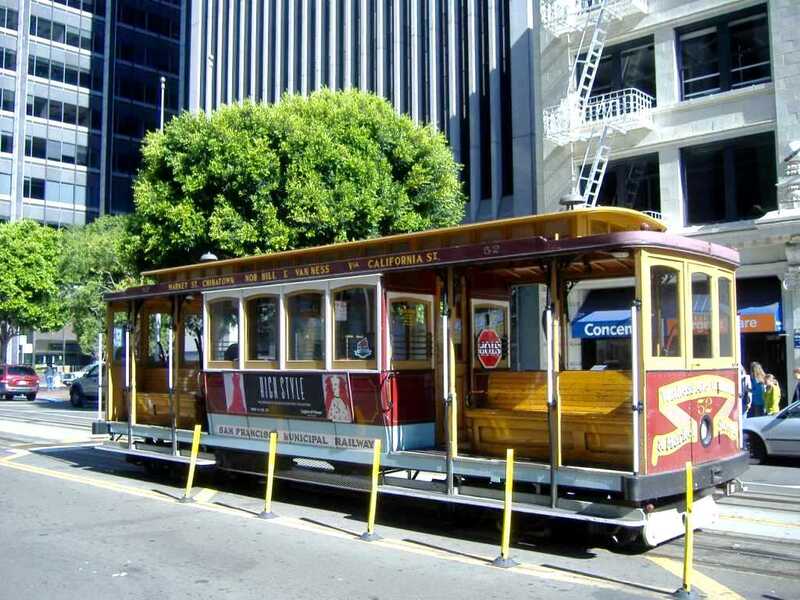 One of the must do’s on my list while visiting San Francisco was to take a ride on the famous cable car. Not only did I ride on the cable car but I also got to stand on the duckboard on the outside of the carriage. We had not planned to ride on the outside but were thrilled as the car was too full to sit down on the inside. We realised quite quickly to ride on the outside is very special. Although the cable car does not go fast it is still quite precarious. You must make sure that you hang on to the special poles on the outside of the car and you must pay close attention to the gripman as he will alert you to any potential hazards along the route. Many times he told us to lean in as far as possible as we passed close to other vehicles etc. This icon of San Francisco is the world’s last manually operated cable car system. Of the twenty-three lines established between 1873 and 1890 only three remain – two routes from downtown near Union Square to Fisherman’s Wharf, and a third route along California Street. We originally planned to take the cable car up from Union Square however when we arrived there, the line of people waiting was almost unbelievable and we were told there was at least a 2 hour wait. That is too long for me to stand. We looked up the cable car website and learned that the one travelling up California Street was in fact quite near to where we were staying. So we headed off early the next morning and arrived to be the first there. The one way ticket cost $7 however we bought the all day ticket for $17 which included unlimited travelling on the cable cars plus also the buses. There are several different passes including 3 days, week, etc. Check their website. Catching the magic views on the way, we travelled up to the top of California Street through Chinatown, passing the lovely houses over Nob Hill and stopping at Van Ness Avenue. After a short stop at the top we then caught the cable car part way down to where we changed over to the car that goes down to Union Street and Fisherman’s Wharf. What a pleasure, we not only got to ride several cable cars, we did not need to line up for several hours and we stood on the outside. I stood on the duckboard and hung on as well. The car was very crowded. I took the one go Fisherman’s Wark as well as the California line. What great fun and so typically San Francisco! Yes it was so much fun, I felt like a kid again. The ride on the outside of the car is certainly exhilarating! Glad you had a chance to experience it!! Its been years ago, but I have fun memories of hanging onto a cable car in San Francisco that was very packed with people. It was kinda scary but fun at the same time:) Nice post Lyn. Thanks Susan, it was actually very exciting. I felt like a young girl. I agree with all the above – a very exciting experience and I do remember the guard yelling at me to keep my head in! Fun Lyn! Love the look of the inside of the cable car as well. Thanks Georgie, these cable cars are very old and look it. The cable car was my favourite memories of San Fran. My friend lived in Russian Hill at the time which was right on one of the routes. I ran to Fisherman’s Wharf then up that steep, crooked street whose name I can’t remember ?maybe it was Lombard. That wasn’t such a smart move, but I hopped on the back of the cable car to go home. Need to go back soon! I think the cable car will be my most fond memory of SF. I loved it. Yes I think it was Lombard St.